$25.00 Gift Card [GIFT-00004] - $25.00 : Fancy Fonts Embroidery, Home of the ORIGINAL Trendy Dots Font! 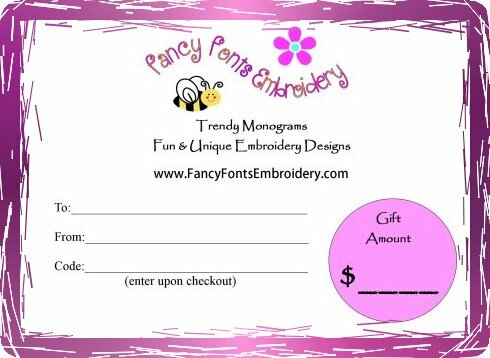 Fancy Fonts Embroidery gift cards are the perfect gift for any occasion!! A perfect gift for any embroidery enthusiast or for yourself!! 1. Add the gift card to your cart. 2. Complete the check out process. 3. You will then be sent an email (within 24 hours, but normally within an hour) with a redemption code. You can then redeem that code either by clicking on the link or by keying in the code on the checkout-payment page. You will then have funds available to use right away or future purchases. You decide if you would like to use those funds for yourself, OR you can email them to friend(s) via the links provided automatically in your account. You can mail as much as you want, to various people, up to the amount you've purchased. Whoever you email it to will receive a new redemption code and will follow the same redemption process ... and can email the funds again if they wish.